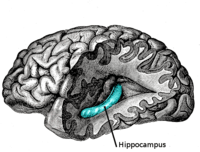 “You never heard of the hippocampus, the part of your brain that remembers things, especially new stuff. If you move to a new neighborhood and go out for a walk, how to get back home. Where you parked at the mall or the date of a doctor’s appointment. Well Todd’s hippocampus is shrinking, just like, he used to be six foot one and is now five ten. It’s part of the aging process. Remember “The Graduate” and Dustin Hoffman learning that the key to the future was plastics, the hippocampus is now the key to remembering, or so it seems. “That’s because it’s new information, your hippocampus could already be damaged. Ever have hypoxia, heart attack, respiratory failure, sleep apnea or near drowning? They discovered new benefits to jumping up and down for extended periods. Exercise may slow shrinkage of the hippocampus and specifically the part that passes new information into permanent storage. This sounds like a conversation I have had with my husband….one book but on different pages……sometimes not even the same book…we’ve lived together too long….. I know a guy, Mr. wonderful, who fell and hurt his head pretty bad recently.. On one of his walks after the accident, he ended up in my living room wanting to cook me and my wife an italian dinner.. Sounded pretty good to me I told my wife but she declined and made me Follow Mr. Wonderful home, just to make sure he got there, but also reminded me to take along my GPS to get home in case I forgot where I lived.. I then called David, I think.. Not sure where this is going.. Can anyone tell me what we are talking about?? Cute! Loved this! Guess I should quit exercising now.